Pastor Thomas Clinton Stark was born and raised in Dallas, Texas. He graduated from The University of Texas at Austin with a double Bachelor of Arts Degree in Latin American Studies and History. During college Pastor Stark was converted to Lutheranism from the Southern Baptist creeds while at Trinity Lutheran Church in Austin. After college he taught high school Spanish and coached the boy’s junior varsity basketball team at Lanier High School in Austin. During this time he met his future wife, Brianne, at church while she was finishing up her Bachelor of Science in Nursing at The University of Texas. Pastor and Brianne were married in 2003, which was also the same year that Pastor began his studies at Concordia Theological Seminary in Fort Wayne, Indiana, and Brianne started as an R.N. in the ICU at Lutheran Hospital in Fort Wayne. Pastor Stark’s vicarage was at University Lutheran Chapel in Boulder, CO. After vicarage Pastor and Brianne celebrated the birth of their daughter, Mary, in January 2007. 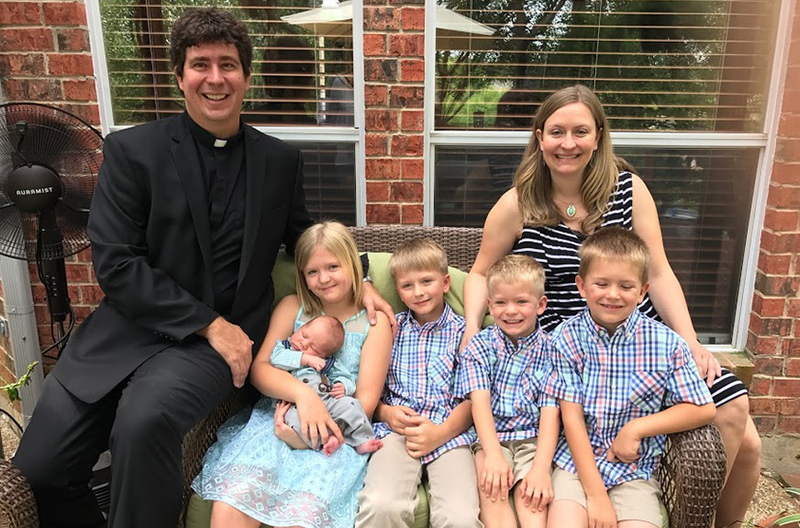 In April 2007, Pastor Stark received a Divine Call from St. John’s Lutheran of Topeka, KS, to serve as their associate pastor, and graduated from seminary in May. During their time in Topeka, Pastor and Brianne were blessed with Henry (July 2008) and Wyatt (July 2010). Brianne spent most of her time in Topeka as a stay-at-home mom, but also worked part-time as an RN in labor and delivery. In 2011, Pastor received and accepted a Call to Zion Lutheran in Chippewa Falls, WI to serve as their pastor. In December, 2012, Pastor and his family were blessed with the birth of another son, Simeon. In 2016, Pastor accepted the Call to serve as the pastor of St. John and was installed October 30. Pastor also enjoys playing and watching most sports, cooking, and spending time with his family.